In nearly every civilization with historical records, we find stories of people who went off by themselves to live in the wilderness. But not all hermits were the same: some were outcasts, some were holy, and others were extremely fashionable. All their stories are extraordinary. All hermits seem attracted to heights. This is never more apparent than in the Far East. Both China and Japan had thriving traditions of mountain hermits, but they weren't necessarily hermits as we think of them. In ancient China, becoming a hermit didn't mean a person was seeking spiritual enlightenment. It meant they were turning away from a corrupt world. People became hermits as a way of declaring their distaste for the state of human society. The more they gave up, the more that declaration meant, so the most famous and revered hermits often came from the upper classes. Nicknames for hermits included "hidden princely ones" and "scholars who fly to withdrawal." The more a hermit gave up, the more impressed people were, so most hermits did withdraw to mountains and cliffs, but it was the withdrawal, not the location, that was the point. Some hermits simply disappeared into their home, cutting off contact with society. Japanese hermits were also not quite the hermits most people picture. Hermits could wander on their own, but they could band together in twos, or even live as communities. Unlike China, these hermits did have strong religious traditions. They went to the mountains to spiritually contemplate nature, but they also often studied religious texts and practiced self-defense. (They were isolated, not stupid. Other people lived in those mountains.) They were educated, they were practical, and they were, at first, independent, so people sought them out for advice. Over time, certain reclusive communities grew in prestige and power. Corruption set in, as the communities became tied to landed nobles. Eventually, Japanese hermits picked up the Chinese tradition of abandoning their communities on principle and wandering the wilderness of the mountains. These wandering hermits became spiritual reformers. They cemented the idea of eremitism as a spiritual ideal. If you want to find someone who's definitely not corrupted by the world, find the guy who's most isolated. The Byzantine Empire became famous for its special brand of urban eremitism. Hermits, instead of going out into the wilderness, would become isolated where everyone could see them. They built pillars, sometimes right in the middle of towns, and climbed them as young men, never to come down. Saint Simeon Stylites the Elder was the first of these hermits, called stylites. He lived in 432, and was said to have spent 37 years on top of a pillar in Aleppo, Syria. Stylites lived with the help of the community around them. Simeon got bread and goats milk once a day, hauled up by whatever boy in the town was nimble enough to climb the pillar. Between praying and communing with god, the stylites would loudly preach to the community below them. While stylites were popular through the middle ages, they seem to have disappeared by 1500 AD. The tradition recently revived. There is one living stylite. A monastery in Georgia recently built a small house on top of a rock outcropping. Father Maxim, one of the monks, now lives on the 130 foot tall natural pillar. If that seems cushy for a stylite, consider that for the first two years, the fifty-something man slept in an old fridge to protect him from the weather, and that the ladder ascending the pillar takes twenty minutes to climb. Europe had a variety of monasteries where men and women could choose to live in different degrees of isolation. Some were simply communities that occasionally prayed. Others had strict rules against speaking, and had no contact with the outside world. Disturbingly some medieval hermits were forced to become hermits as children. It was a tradition, among noble families, to "give" a child to the church. This involved building a room along the wall of a local church, putting the child inside, and bricking it up. The room did have an opening onto the main church, so the child could receive food, send out waste, and hear the priests and the choir. Sometimes, an older hermit was walled up with the child to take care of them. Still, it was pretty grim. The most famous of these forced hermits, called anchorites, was Hildegard of Bingen. She eventually escaped the room. In her teens she began having ecstatic visions and became the most famous woman of her time. Famous for writing religious treatises and composing music, she traveled, lectured, and corresponded with popes and kings. Eventually she created a convent of her own. Europe's need for hermits was so great that, after the monasteries fell, it became fashionable to hire ornamental hermits. Rich English and German nobles with extensive estates would build a little false hermitage and hire someone to live there. 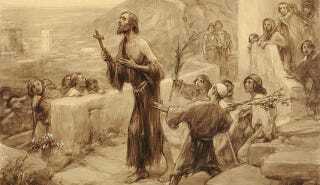 The hermit would sometimes come out, usually at dinner parties, and do a little preaching to the nobleman's guests. The hermit was also expected to be slack in his grooming, sleep on hay, and carry around heavy books. Some ornamental hermits had to tend their own gardens, as well, with picturesque instruments. The job paid well, and not much paid well in the 17th century, so hermits were readily available. There are modern hermits. One man spent years in China wandering from one shrine to another, finding hermits who lived in the woods nearby. Japan has hikikomuri, young people who never leave their homes, both because their parents are their only support structure and because they see no point in even attempting to win out in what they consider the over-competitive and unrewarding Japanese job market. And, of course, there are people who simply choose to live alone. But, while those people are hermits, they aren't the hermits we hear of throughout history. Eremitism, paradoxically, has an important social component. Society seems to want people who turn away from it, either to cleanse themselves of corruption or find a more spiritual way of being. Society seems to especially want people who isolate themselves while doing something random and crazy - like the stylite who never faced west so the sun would never set on his face. And society really, really wants the people who do that to give it advice. Like it or not, the people who live for a year in a yurt on the roof of their parents' house, or go trekking through the Andes without any pants on are fulfilling a proud tradition. This Friday, Wild comes out. It's a film based on a memoir by Cheryl Strayed. At twenty-six, plagued by personal demons and without much money, Cheryl Strayed changed her name, took up a backpack, and despite being totally unprepared, walked 1,100 miles along the Pacific Coast trail. Afterwards, she became an advice columnist. Now that is a hermit.